As requested. . . Wii Mario Kart is a very easy game to play, and has some nice dummy-proof features. Elijah has even played it and likes the scene that goes through a farm and has cows crossing the road. I, of course, like the beach/ocean scene. Good clean family fun it seems – well-clad characters and animals as options for the children to be (Elijah loves the “turtle” don’t ask me what his name is.) I’m sure Jeremy, Ryan, Vince, Josh or some other more experienced Mario player will comment and inform you of the turtle’s name. The other day Elijah passed a little gas and I said, “oh, excuse you,” to which he replied, “I burped,” reaching back behind himself. I’m not correcting that one – let him think it’s a burp until another little boy corrects him. I am using Jeremy’s laptop as my keyboard on my computer dries out after Merry practiced dumping (her latest favorite activity) a glass of cold water all over it. We’ll see what happens. Tonight I am trying to get myself a little organized for some formal schooling with the children. I am realizing that Merry wants to do everything Elijah does and is parroting so many things, so I am going to take advantage of that. She is showing some signs of being ready for some organized activities (she is emptying things and sorting them and setting them out according to different categories, all on her own) and Elijah LOVES to teach her things, so I may try to tap into that. I’ve been duly chided. Jeremy says it’s been 9 days since I’ve posted about the children or us over here in the US. I guess he thinks it’s cheating to post stuff about him and his videos and keep you all updated on him . . .go figure! I guess he doesn’t think it’s as interesting as we are. My list for today included going to the the post office to mail a few packages, which is a field trip in itself, one trip to a Game Stop (yes, Adina went to a video game store!!) and a stop at the arena near us to get GOOD SEATS (got to love the military discounts!) for Disney on Ice for our family for the 16th of NOVEMBER. . . our whole family of 5 will go for $31.50 (and I didn’t purchase the cheapest tickets either!) I am praying Jeremy will be home, and it looks like that may very well happen! I was so excited to buy something that had a date on it for AFTER his return potentially! So, I find out they have some at the Game Stop down the road, and I get there and purchase the second to the last one they have; I get in the van and explain to Elijah and Merry that we finally got Dadda his game for his birthday; as we drive away, Elijah says, “I want to see ‘da game for Dadda, Momma.” So I hand it to him in the bag, packaged up, he opens the bag (I can hear this, I’m driving out of the parking lot) and says “I’ll show it to Mimi. . . WOW, look at ‘dat, what a nice game!” (LOTS OF DRAMA in his voice) I chuckle to myself as he has no idea that it isn’t a new version of “HiHO Cherry-O” or something like that. He continues in the back, “Look, Mimi, you’re really gonna’ like ‘dat game, it’s nice.” I laugh even more as I realize that Elijah is more like his daddy than we realize sometimes. . . doing with Merry what Jeremy has already done with me. . .try to make me think I will like playing this “nice” video game, talking it up and showing me how amazing it is. . . I just wanted to give everyone a quick update and post a couple of photos. 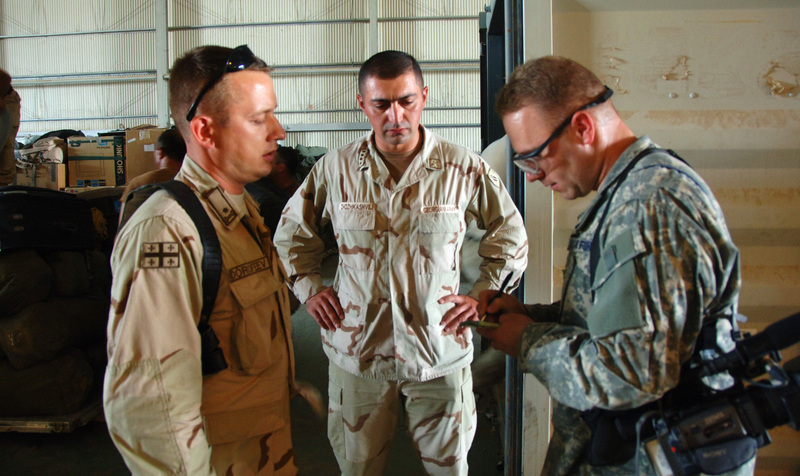 I am settled in at my new location at a Forward Operating Base in Iraq, and have had the opportunity to get a few missions under my belt. With recent events in the country of Georgia, Georgian forces have pulled out of this location and have returned to their country. I’ve been able to document that as well as the Iraqis in the city of Al-Kut along the Tigris River, the cradle of civilization. 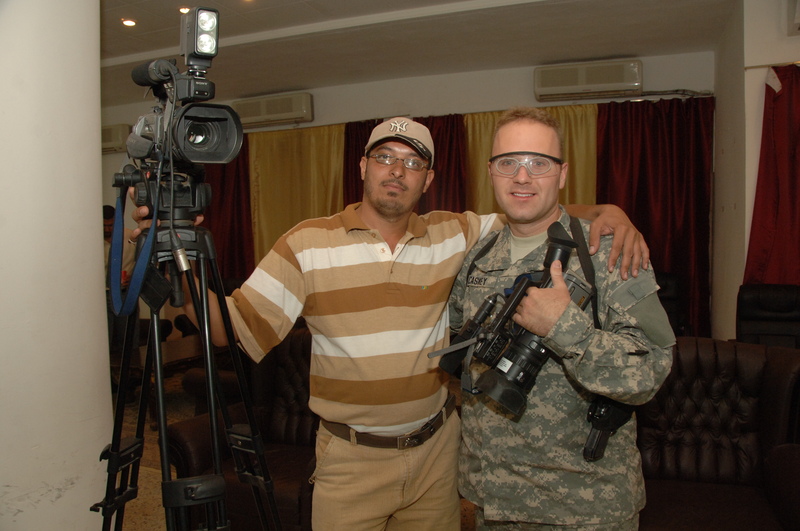 Here I am with a member of the Iraqi media. Me interviewing a Georgian officer. Jeremy is trying to get internet access at his new location (if you want to send a letter, email me or comment with your email and I will send you his address – can’t post it here I don’t think.) In the meantime there is also a flu going around the FOB (Forward Operating Base) so he was put on quarters. Everything you can possibly have as a symptom for the flu HE HAS! You know Jeremy’s sick when he’s only eaten a few crackers! On the way out of there, we spied a Target and Elijah asked to go there, so we went there and got popcorn, a beef hot dog and lemonade because that’s what daddy always does with them (minus the hot dog, but it was lunch time, so I decided to kill two birds with one stone.) It seems that Jeremy has taken on some much healthier eating habits since he’s been gone, and, evidenced by our lunch today, I have regressed. Merry has taken to waving at people everywhere we go. She makes everyone smile, it is so adorable! The Target we went to was in a shopping mall, and I spied one of my favorite stores to window shop in right near the Target, so I let the children loose to run in the mall with me. They were pretty well-behaved until I let Merry’s hand go to look at something right next to the window display. . .and I hear a squeal of glee from both children. I turn to see Merry giggling at Elijah on the other side of the glass IN the FRONT WINDOW DISPLAY under the manikins. She was way cuter than the manikins, so it was pretty funny. Elijah thought it was hilarious that she was in there with all the ladies! This is the first time he pretended to be reading words (this is the next step for him in learning to read), following them with his finger like I do. It was the most precious memory made . . . what a great “first read” with phenomenal content! Who knew you could get that off a water bottle label? Yesterday at the sprinkler park, Elijah was having a difficult time obeying, so after several warnings and “time to think” sitting on the side, I told him “I’ve shown you lots of grace and given you many chances to choose to obey, but now we have to go home and be disciplined, because you keep disobeying Mommy.” We start getting ready to go and he looks up and me and says, “I want some grapes now.” Try to explain the difference between grace and grapes to a 3 year old!